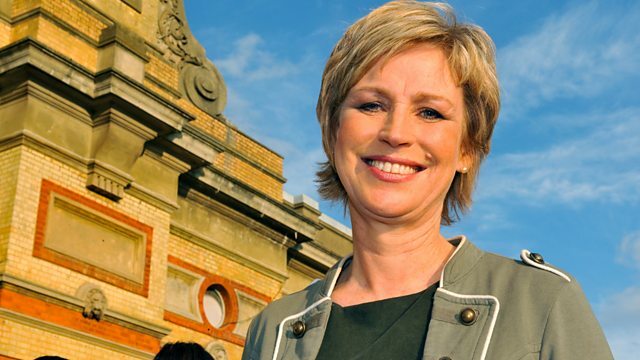 Sally Magnusson presents traditional hymns from All Saints Church, Pittville, Cheltenham, with performances by Only Men Aloud, Mary-Jess and Libera. Browse content similar to Palm Sunday. Check below for episodes and series from the same categories and more! Cheltenham is a festival town. that also takes place on the town's famous racecourse. gathered - pilgrims preparing for the Jewish festival of Passover. As Jesus entered the city, people praised him by waving palm branches. are read by Julian Rhind-Tutt. when he rode into Jerusalem - a donkey. "and he sat on it. "and others spread leafy branches that they'd cut in the fields. "'in the name of the Lord.'" in six days of drama that was to lead to his crucifixion. his impending suffering and glory. washing the feet of his disciples at their last meal together. "'that you also should do as I have done to you.'" Jesus's example of service is one that continues to inspire people. from urban street sports to essential life skills. is to be a hands-and-feet ministry first and foremost. and into the mess of life with the people that we work with. and those who are actually already excluded from education. are similar to those that Jesus worked and walked with in his day. and the hoodies of our day are rejected. who come into our building and we engage with. "Go and do the same, I've given you an example - go and do the same." is in the Garden of Gethsemane. he prays to his father that this cup of suffering be taken from him. They went to a place called Gethsemane. He said, "Abba, Father, for you all things are possible. "Remove this cup from me. "Yet not what I want, but what you want. Jesus's words reflect his trust in God in the direst circumstances. Our next piece of music is also a prayer. It's written by a 19th century clergyman, George Croly. It too is a cry from the heart. and, though innocent, is found guilty. were looking for testimony against Jesus to put him to death. This story of injustice still resonates today. against the government in her native Zimbabwe. ..Are crushed and crushed fully. The Mugabe regime, it is very powerful. but which were taken over by the local authority. And they responded through violence. We were beaten and, er... so many things happened. People lost their lives, some disappeared. and...you know, horrible things happened as well. I was in fear of my life. you just don't trust any more. I left Zimbabwe in August 2000, and I came here and seeked asylum. And I got my asylum status. I'm a recognised refugee now. when I see them in the street! because whatever I did, I said, "This thing has to happen for a reason." and I just put everything in God's hands. And maybe that made me get to this stage where I am today. and I just thank God every day, to be honest, every day. Even if I don't say it loud and say, "Thank God,"
I just believe God is there. # Which angels do admire? who fell in the First World War. is at the heart of much Christian art and music. depicts the scene in all its darkness. "..they crucified Jesus there with the criminals. "One on his right and one on his left. "'for they do not know what they are doing.'" if we are able to walk along it at all - is a long and painful one. was murdered in a random attack by a group of youths. I was so full of rage. I could feel it coming up inside of me. "Vi, as Christians we are going to have to forgive the boys that did this." I just went absolutely angry at him, I just screamed at him. I said, "I'm not doing that!" How did you move from all that anger to forgiveness? the families of the boys that killed Chris, everybody lost something. but it will never be the same for them. The compassion began to come back into me. God's compassion for them. and I was drinking it and they weren't feeling it, I was. and Chris wouldn't have wanted that, for me. So I decide to choose to forgive. What happened when you met one of your son's killers? I was able to tell him that I forgive him. I was able to hug him. That's remarkable love. Not my kind of love, it wasn't my kind of love. that you can't help but want to give it out. I felt compassion for him. He was 15 when he went in prison, he is now 25. When I heard him say, "I'm sorry,"
when I heard him say, "I was a coward,"
He could have been my son. "Mary, the wife of Cleophas, and Mary Magdalene." and just watch your son die in front of you. It must be the most horrendous thing. ..but I kind of feel and identify with that now. because it's not a good place to be in. and I'm sure it was true for Mary. Everything about it was so negative. ..I used it in a positive way. and it's still a symbol of grief today. is one of the most beautiful pieces of music about Mary. It's often used as a funeral anthem. Christ crucified to draw you to himself. and the assurance of sins forgiven. The Dream of Gerontius by Cardinal Newman. "in the light of the salvation brought by Christ." Paul Jones, Ramin Karimloo and Laura Wright. Sally Magnusson presents traditional hymns from All Saints Church, Pittville, Cheltenham, with performances by Only Men Aloud, Mary-Jess and Libera. The story of Jesus's last week is told with Bible readings by Julian Rhind-Tutt.